The built-in Class D DSC provides additional safety at sea. The built-in DSC watch function monitors Ch 70 (DSC channel) activity, even while you are receiving another channel. Distress, individual, group, all ships, position request/reply, polling request/reply and DSC test calls can be sent. DSC messages can be received and automatically stored in the message memory. When connected to Icom's MA-500TR Class B AIS transponder, you can make an individual DSC call without having to manually input a MMSI number. The IC-M12 can withstand submersion in 1m of water for up to 30 minutes (except cables). The supplied microphone also has submersible protection. The large backlit LCD (23.5 (H) × 64 (W) mm; 15⁄16 × 2 17 ⁄ 32 in) shows a full sized channel number. A 10 character scrolling message shows the channel name and can show position, time and DSC messages. When connected to an external GPS receiver, current position and time are shown on the IC-M412's display. 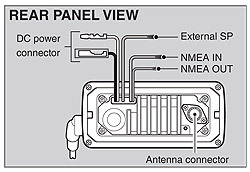 When receiving position information from another vessel, the IC-M412 can transfer it to a navigational device via NMEA 0183 connectivity. The IC-M412 has 0.22μV (typical at 12dB SINAD) superior sensitivity for class-leading receiver performance. The front facing speaker offers 4.5W (typical) of loud, clear reception. Black or super white are available. Same as supplied. 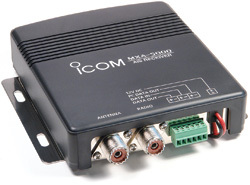 For flush-mounting the IC-M412 to a flat surface such as an instrument control panel.